Oliver James Campbell was born at Moss Yale, Carmarthenshire on the 9th July, 1879. After a public school education he emigrated to Australia and there he met his future wife Clara and resided at 8 Womerah Avenue, Darlinghurst, New South Wales. Oliver joined the 6th Imperial Bushmen and served with them for twenty months during the Boer War. During the course of his service in South Africa he sustained a leg wound. After the outbreak of the First World War he enlisted into the Australian Army at Rushcutters Bay NSW on the 11th September, aged 36 years. He was described on his attestation papers as being 5ft 8ins in height, weighed 168lbs, had a chest measurement of 38ins, with hazel eyes, light brown hair, a fair complexion, had no distinguishing marks, religious denomination as Church of England, and gave his occupation as that of a tram driver. Oliver appeared before a medical board on the 25th September, and was pronounced medically fit for overseas service. On the 11th October, 1915 at Holdsworthy he swore the oath of allegiance to King George V and arranged for three-fifths of his pay to be allotted to his wife. Initially he was posted to the 11th Reinforcement Battalion. He attended No.7 Officers School and qualified in a competitive examination for Second Lieutenant on the 28th January, 1916. His promotion was officially gazetted on the 16th February and he was appointed to the 20th Battalion. The battalion had been raised in March 1915 at Liverpool, NSW for service with the Australian Imperial Force. After initial training in Australia they embarked for the United Kingdom. On arrival there, they were supposed to begin training on Salisbury Plain before being sent to the Western Front. However, the facilities there had not been completed to accommodate the Australians. The Canadians were undergoing their training on Salisbury Plain and living in tents as no hutments had been completed. It was therefore decided that the 20th Battalion would complete their training in Egypt in preparation for service in the Gallipoli campaign. They participated in the latter operations of the August offensive and thereafter in defensive duties of Russell's Top, until the evacuation in December. Returning to Egypt the battalion was reinforced and trained for service in France, arriving there in March 1916. Lieutenant Campbell as part of a reinforcement draft for the 20th Battalion embarked for overseas service at Sydney on His Majesty's Transport Ship "Nestor" on the 9th April, 1916. He arrived in the United Kingdom at the beginning of June and was sent with the draft to Salisbury Plain for training prior to deployment on the Western Front. Whilst there Oliver succumbed to bronchitis from which after treatment he recovered. The intensive training had aggravated his Boer War leg wound which although healed, left him with a varicose ulcer which erupted on the 1st October. He was sent to the 6th Auxiliary Hospital for medical treatment which failed to improve the condition of his ulcer. By early December there was still no significant progress and he was transferred to Cobham Hall Hospital on the 5th. Gradually, throughout December the condition of his leg ulcer began to steadily improve and heal. On New Year's Day 1917 Oliver was informed that he had been promoted to Lieutenant. The doctors at Cobham Hall discharged him on the 27th January, 1917 and he was transferred to the No.2 Australian Command Depot at Weymouth for light duties. Before leaving the hospital he was aware that another medical examination was required to determine if he was fit enough for service on the Western Front. The lightly prognosis, due to his ulcer would be a recommendation to return him the Australia. Oliver arrived at the Australian camp at Weymouth on the 29th January, disappointed that he had not been pronounced physically fit for general duties. Nine days later on the 7th February, Oliver was found dead having committed suicide. He was 37 years of age. The following day, the Coroner for South Dorset Mr G.P. Symes opened the inquest into the death of Lieutenant Oliver Campbell at the Monte Video Camp. Lieutenant J.R. Newman of the Australian Imperial Force confirmed that the jury had viewed the body of Lieutenant O.J. Campbell and informed them that he was a married man from Sydney. He had arrived at Monte Video Camp awaiting his return to Australia as an invalid. On Saturday 3rd February he had been arrested for drunkenness. After appearing before the commanding officer he was confined to camp and placed under the charge of Lieutenant Newman. He was of the opinion that Campbell was very depressed and imagining falsely that everyone was against him. Lieutenant Newman slept in the same room with Campbell on the Tuesday and the night passed peacefully. On the Wednesday morning at about 0800 hours the servant came into take orders for breakfast. Newman dozed for a few minutes and was awoken by, as he thought someone being sick. Rousing up he heard someone fall on the floor and saw Campbell lying in a pool of blood. He immediately called for a doctor who on arrival confirmed Campbell was dead and that a razor was lying by the side of his body. Newman also found two letters on the table which he had placed before the jury. He further stated that Campbell was very worried about his leg ulcer which most probably would prevent him from going to France. The Medical Officer, Dr T.H. Strangman had met the deceased on board the transport ship from Australia. He next saw him when he arrived at Monte Video Camp. They talked things over and Campbell was downhearted about his leg. Dr Strangman examined the leg which revealed to him an old wound that had not healed and although Campbell wanted to go to the front he was unfit for service there. Campbell thought it was his duty to fight and not to do so was disgraceful. When he was called to examine the deceased he had a very deep wound to the throat. Asked by the Coroner what the words "unpardonable offence" meant in the letter Campbell had left. Dr Strangman replied, that he thought it referred to not being able to fight. Captain H. Nelson-Slee, Australian Imperial Force had spent some time with Campbell, who had been drinking heavily on the Saturday. He thought the deceased was very nervous and had mentioned that everyone was against him. The Captain thought he was suffering from hallucinations. Private Alexander Game the deceased's servant stated that Campbell was very miserable and silent. On Wednesday morning at about 0800 hours he entered his room and said that Campbell was walking to and fro and then got back into bed. Although the deceased was talking to himself he took the order for breakfast and noticed that the Lieutenant had a hand mirror in his bed. 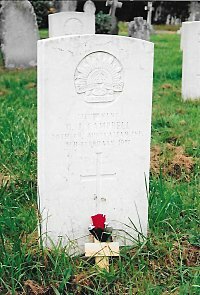 "That the said Oliver James Campbell died on the 7th day of February 1917, at the Parish of Chickerall, in the County of Dorset, from a wound in the throat self-inflicted while in an unsound state of mind caused by mental depression at not being in a fit state of health to go the fighting front, and so the Jurors aforesaid, upon their oaths do further say that the said death was self-inflicted caused by temporary insanity and the Jurors aforesaid do further say that the said Oliver James Campbell was a male person of the age of thirty eight years and a Lieutenant in the A.I.F., stationed at Monte Video Camp. Chickerall, Dorset, Native of Sydney." 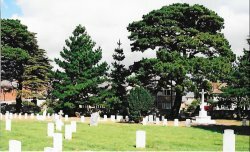 Lieutenant Oliver Campbell was buried with full military honours on the 9th February in Melcombe Regis Cemetery, Weymouth. Grave Location: Section III, Row C, Grave No.2722. His name is also inscribed on the Australian War Memorial, Canberra - Panel No.90. The effects of her late husband were sent by the AIF Kit Store in London to Clara Campbell which she received and acknowledged on the 9th August, 1917. She also received in 1921 his British War Medal 1914-20 and in 1922 the Bronze Memorial Plaque, Memorial Scroll, "Where The Australians Rest" pamphlet and a photograph of her husband's grave. He was not entitled to receive the 1914-15 Star or the Allied Victory Medal 1914-1919. In the autumn of 1930 Mrs. Campbell received a copy of the cemetery register with the details of Oliver's place of burial. 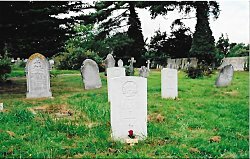 The registers were produced by the Imperial War Graves Commission and could be purchased at a cost of three-shillings and sixpence. [Source: Southern Times ~ 10th February, 1917.